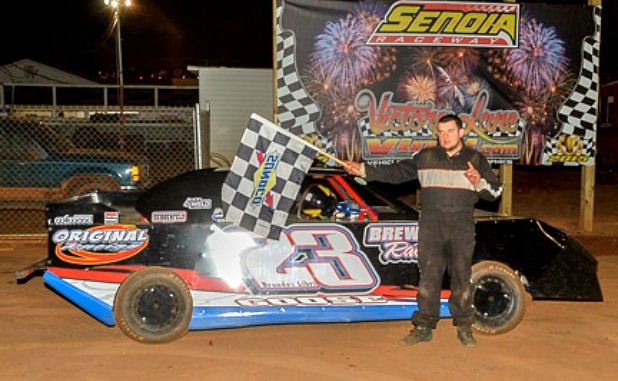 Tod Darda added to his late model career win total on Saturday night at Senoia Raceway. The veteran driver from LaGrange held back every charge Austin Horton of Grantville attempted during the final half of the thirty lap bonus race. Horton came home as the bridesmaid for the second straight race. Senoia’s Clint ‘Cat Daddy’ Smith won for the second time this season in the Super Late Models while some of the track’s young guns stepped into victory lane in other divisions. Nineteen-year-old Taylor Mitcham of Lafayette, AL, picked up the victory in the Crate Late Models while 18-year-old Brandon Libri of Newnan bested the Mini Stocks, and Winder’s 18-year-old Austin Brumbelow topped the Modified Mini. Palmetto’s Josh Roddy took home the laurels for the Bombers, Franklin’s Ben Steele finished first in the Hobby Stock feature, and Newnan’s Parrish Duncan doubled his 2015 win total with a checkered flag in the B Cadet main event. The duo took the green flag and raced side by side until the race’s first caution. Austin Horton, 19, took advantage of the restart moving past Jones into second place leaving Jones to battle with Senoia’s 17-year-old Joey Armistead for the third place position. The young crop of talent is flexing muscle early. Thomaston’s Shane Fulcher had climbed to the number five spot by lap 10 when the field came upon the slowing Shane Criswell of Bowden. Fulcher made the move low to get around Criswell but his Ford slid up into the front stretch wall bringing out the yellow. Two-time defending Limited Late Model points champion Glenn Morris of Fayetteville had moved his Chevy to the number four spot while Darda, Horton and Armistead sped away. Also climbing through the rankings after starting nearly scratch on the field, Newnan’s Rucker Orr found the top five with a dozen laps remaining. The show to watch was at the front of the pack. Veteran Darda held the low groove but would slide up between the inside and middle groove in each turn. The budding star Horton would slide in under him and get door to door only to have Darda shoot back out front entering the next turn. The crowd was cheering for each driver on every lap over the final 10 circuits. At the end, Darda would hold off all the challenges to win the extra money and secure the victory. Horton would have to settle for second with Armistead holding back Rucker Orr third place. Dusty Jones fought his way past Morris in the final five laps to nab a top five. Three teenagers dominated the show in the Crate Late Model feature. Alabama’s 18-year-old Dylan Knowles led at the drop of the green. He was pressured immediately by 16-year-old Trey Wood of Newnan and Taylor Mitcham. The young men traded positions running the high side and low side of the newly configured Senoia Raceway with Mitcham moving past Wood near the halfway mark. One lap later, Mitcham scooted past Knowles and into the lead. It was a lead that he would never relinquish including a green-white-checkered finish due to a late race caution. Kyle Clifton used the restart on that caution to move past Knowles, but he had nothing for Mitcham. The B Cadet feature saw another of those young guys sparkle. Veteran Parrish Duncan led the field at the drop of the green, but 17-year-old Jake Traylor gave chase. Duncan built a pretty good lead until he caught up to lapped traffic. That is when the fearless Traylor reeled him in. The leaders darted in and out of traffic until a caution slowed the race on lap seven. On the restart, Duncan shot back out to the lead leaving Traylor to fight for second with Tallapoosa’s Michael Coggins. Traylor and Coggins swapped the second place position for several laps while Duncan built on his lead for the second time before another caution at the halfway point of the race would bunch everyone back together. Duncan could not pull away on this restart as Traylor stayed with him under the green flag laps. Coggins faded back a little and found himself in a race for third with Craig Scott of Jackson. Scott had come from the last place position after having issues during preliminary round action. Duncan and Traylor were the first to catch lapped traffic at lap 16. Duncan slowed down allowing Traylor the opportunity to shoot past and steal the lead. But Duncan fought back and returned the favor two laps later. Just behind, Coggins and Scott were racing through the same lapped cars and were swapping their position back and forth. When the final flag flew over the field, Duncan had his second win of the season with Traylor having to settle for the runner-up spot. Coggins would out duel Scott for the show position while a patient Johnny Stinchcomb of Newnan rounded out the first five finishers. In the Hobby Stock, Ben Steele moved past a wobbly Chad Foster of Griffin to take the lead on lap two. Steele would cruise to the victory keeping Foster a bridesmaid for the second race this season and seventh time over the past 12 months. Foster is still trying to win his first career feature at Senoia Raceway. Josh Roddy took advantage of Newnan’s Kevin Evans car breaking on lap 14. For the second straight week, Evans was unable to finish a race that he controlled up until that point. Roddy battled Griffin’s Alex Rudolph and Senoia’s Winford Minix before pulling away to take the checkered flag. Minix would end up in second ahead of Rudolph. Bonaire’s Hunter Cossette was fourth with Senoia’s Chris Holt completing the top five. The trend of teenage drivers competing so well continued in the Mini Stock as Brandon Libri led, then lost the lead and then regained the lead from all-time Mini Stock feature win leader Brandon Bright of Newnan. Bright would settle for second ahead of Senoia’s Robert Caldwell, Sharpsburg’s Darrin Parrott and defending Mini Stock points champion Harold Leath of Griffin. The final race of the night was dominated by local professional Clint ‘Cat Daddy’ Smith as the veteran went flag to flag to win the Super Late Model main. Alabama’s Scott Knowles provided the chase, but could not catch the four-time Southern All-Stars dirt late model champion. Fayetteville’s Ricky Williams was third. On Saturday, April 4, Senoia Raceway will celebrate the Easter holiday with a huge Kids Easter Egg Hunt featuring thousands of prize filled Easter eggs. Children of all ages are invited to participate in the hunt about 7:30 p.m. and prior to feature racing around. The first 100 kids ages 5 through 12 entering the grandstand gate will also receive a free Easter basket courtesy of A to Z Companies of Douglasville. Racing action will include competition in the Super Late Models, Limited Late Models, Crate Late Models, B Cadets, Hobby Stocks, Mini Stocks, Bomber and Legends Car divisions. For more information, visit the Senoia Raceway website at www.senoiaraceway.com.